The relationships between science and religion are about to enter a new phase in our contemporary world, as scientific knowledge has become increasingly relevant in ordinary life, beyond the institutional public spaces where it traditionally developed. 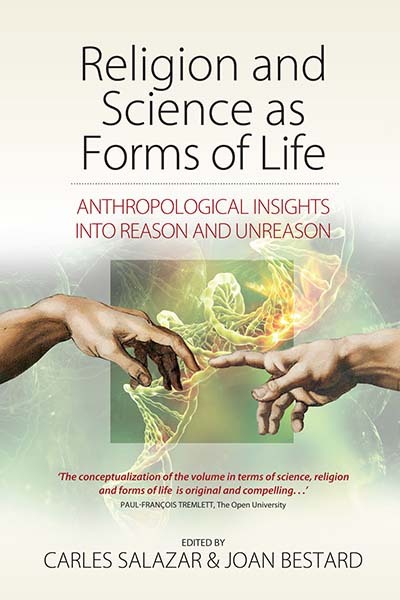 The purpose of this volume is to analyze the relationships, possible articulations and contradictions between religion and science as forms of life: ways of engaging human experience that originate in particular social and cultural formations. Contributions use this theoretical and ethnographic research to explore different scientific and religious cultures in the contemporary world. Carles Salazar is Professor of Social and Cultural Anthropology at the University of Lleida. He received his PhD from the University of Cambridge and has carried out ethnographic fieldwork on cooperation, religion and kinship. His publications include Anthropology and Sexual Morality. A Theoretical Investigation (Berghahn, 2006) and European Kinship in the Age of Biotechnology, co-edited with Jeanette Edwards (Berghahn, 2009). Joan Bestard is Professor of Social Anthropology at the University of Barcelona, where he is also director of the research center on Kinship and Family. He has done research on kinship and religion and is currently conducting research on religion in Southeast Poland. His recent publication is Familias (Madrid, 2012). Chapter 7. The Religions of Science and the Sciences of Religion in Brazil.